I wrote this post a while ago and held onto it. I'm finally ready to share it and hope you enjoy. I love Reddit. The community there on r/writing watched me grow from putting my first few words on paper, to participating in NaNoWriMo, to editing my novel and polishing my first query letter. It’s where I’ve met beta readers and where I’ve found some amazing books to read. Something that comes up frequently on r/writing, is when someone new who hasn’t even dabbled in the writing world, asks what it’s like to be a writer. We pull back the curtain and gladly reveal the ugly truth. Finishing a novel is more difficult than you think. It’s incredibly hard to get traditionally published and can take years to see your work in print. You likely won’t make any money. Don’t quit your day job. Then why do so many people want to write? We’ve got this romanticized vision of an author in a dark office sitting at a large oak desk, poking the keys of an old typewriter. Once this myth is dispelled, most aspiring writers tuck their tail between their legs and sulk away. There are certainly others who do write. 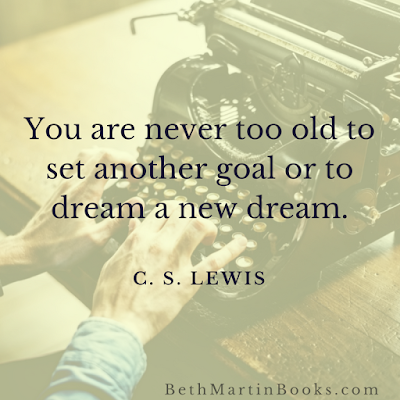 They dedicate themselves to drafting, revising, editing, querying, and remaining hopeful about the chance of one day having their book for sale. Some are certainly motivated by the prospect of fame, others by the desire to craft great stories. All I can say with any certainty is why I write. Never in my childhood did I want to be a writer. I wasn’t one of those teens who carried an idea notebook with them everywhere. I did write. I wrote poetry and funny stories and kept a diary even into adulthood, but it wasn’t my only creative outlet. I watched a lot of TV shows when my daughter was an infant. The only chair in our apartment that rocked was in front of the TV, so I’d watch shows on Netflix while I rocked her to sleep, or nursed, or held her after her brother had gone to bed. I watched one show in particular which wasn’t very good. It had the seed of a good idea but focused too much on adding weird plot twists and personal drama. I wished the show had focused on the one small aspect, that golden spark that didn’t get the opportunity to fully flourish. I wanted to nurture the idea and let it reach its full potential. I decided I would write it. I found an old laptop, opened TextEdit, and started writing. Most of my writing was done while my son napped with the baby bouncing on my lap. It was infectious. I needed to get my story out and onto the page. When I tried to talk about my story, my husband would say, “Don’t tell anyone about it. Just write it down.” And that’s exactly what I did. I wrote. Every once in a while, I would get stuck and have to take a few days to figure out what was next. I’d research some aspect of the science involved that was getting in my way. I didn’t even mention I was writing to friends and family until I was almost done with my first draft. Six weeks after deciding I needed to write this story, I found myself with a finished first draft. Revisions took longer. The beginning of my story was a mess. Much of my writing had been done while only half awake and many of the scenes weren’t even finished. But once I got through to the other end, I had a cohesive novel which actually made sense. I was so proud of my work, I printed it off and mailed copies to family and friends. Now that I had a finished (at least I thought it was pretty finished at the time) novel, I couldn’t stand not writing. With November fast approaching, I outlined a story about a teenage girl in a medieval setting who was trying to find a unicorn. Life happened, and it took me longer than a month to write. But before I even penned ’The End’ on that story, I had a flash of inspiration for another plot. I wanted to write about a scientist who was struggling with his career and his personal relationships. Soon after finishing my manuscript on unicorns, I was writing a thriller about a researcher who found himself falling in love while the world around him was literally falling apart. Yet again, life happened, and with my bouncing baby now mobile and getting into everything, making time to write was even harder. Even though there were challenges and I purposefully took a long break while moving to a new house, I had to dive back in. My characters were calling for me. They needed a conclusion, and I was the one who had to lay it out. With another manuscript drafted and sitting on my hard drive, I felt like I had gotten it out of my system. That was it. I had tried writing and I could move on with my life. Then something strange happened. An internet stranger who found me through r/writing asked to read my first book. I had sent it to one publisher in hopes of one day seeing it in print but had decided that if they rejected it, I would hold off on the whole publishing thing. I packaged my book in a PDF and emailed it off, not even expecting my new internet friend to actually read it. He did read it. And he seemed to enjoy it. He also told me the ending sucked and needed to be completely rewritten. He was right. The protagonist had known her plan was crazy from the start. She needed to learn her plan was crazy the hard way. With another flash of inspiration, I changed a lot of the ending. Not only was I proud of my revised story, I had to share it with the world. Suddenly, I found myself obsessively researching literary agents and publishers, sending them my carefully crafted query. I officially considered myself a writer, and a successful writer needs a published book. After sending the first few queries, I wondered what my next novel would be. I opened Reddit looking for some inspiration, some seed that I could nurture and grow. Someone posted a writing prompt which caught my eye. A future society where everyone’s DNA gets cataloged at birth. It hit me. I could already see my protagonist investigating the birth of a baby who had no father and an organization doing horrific experimental surgery to alter DNA. I had my idea, and I couldn’t rest until I wrote it all down. To answer the original question posed, why do I write, it’s actually quite simple. 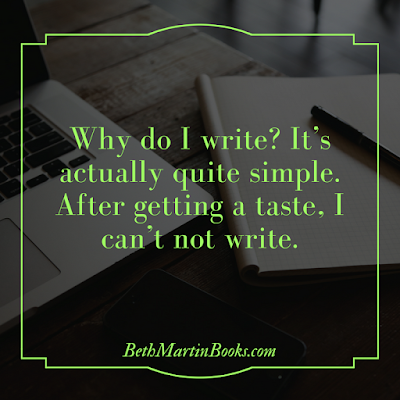 After getting a taste, I can’t not write.